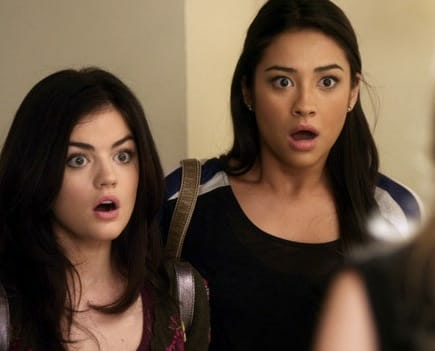 Pretty Little Liars Review: "Someone to Watch Over Me"
Secrets and lies never stay hidden for long on Pretty Little Liars. On "Someone to Watch Over Me," many of the characters were confronted by the consequences of their fibs, but none so seriously as Spencer. We found out a little more about the plan to frame her and developed some more distrust for Ian, but what did we really learn? A has been incredibly quiet lately and continued to remain so this week. Hopefully, as the promos promise, we’ll get a little closer to solving a least one mystery this season. At the current pace, though, should we really feel confident about that? Aside from my frustration with the lack of progress in resolving these mysteries, I felt genuinely sorry for Spencer. It does seem strange that one little lie would make her seem like the most likely suspect. If anything, the evidence would point to Ian. Regardless, the fibers they found will likely cause even more trouble next week, even if her mother is able to get the evidence suppressed. What was great about the predicament - if there’s anything great about being accused of murder - was the growing relationship between Spencer and Toby. Now that they are both pariahs in their community, Toby tried to help Spencer through these difficult times and gave her the support she really needed. This was especially important when Ian tried to get her to run away. Spencer was a lot stronger than he expected and refused to make things easier for him. However, Ian’s warning seemed pretty ominous and he might just tip his hand in the next episode. She thought about fixing this problem by just lying to her mom about her boyfriend, but she opted to be honest, which seems to breaking up her parents again. Her mother realized that their daughter’s secretiveness was a reflection of the way they raised her, but her father didn’t want to accept responsibility for this trait. Aria is going to have to deal with a lot more suspicious from her father, as well as from the police. Also, hiding all of the Ezra-tokens in Emily’s locker feels like a bad decision. So does choice to leave behind a book with such a personal inscription. She was lucky her dad didn’t find it this time, but she won’t always be so fortunate. Paige’s date with Sean accomplished the double duty of hiding her lesbian predilections and making Emily a little jealous. When casually asking about Sean, Paige wondered if things would be weird for Emily because her best friend is Hanna. Emily smartly replied: “That’s not really the weird part, is it?” And she was right. Paige figured out that the lie wasn’t going to work for her and returned to Emily. But for how long? 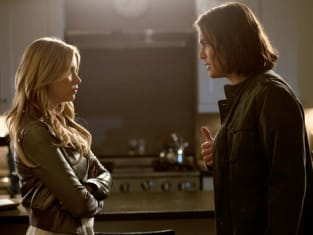 While some relationships seem to be on the right track, poor Hanna had to find out about Caleb’s shadiness the hard way: through Jenna. I do believe that he stopped spying on her once they got close, but Hannahis right to feel so hurt. They shared a very intimate experience together and shortly after she finds out that he only cozied up to her to get information. Two more episodes remain. With all the hype about this season finale, let's hope it actually does provide a genuine game-changer. Pretty Little Liars Round Table: "Someone to Watch Over Me"